A floating desktop clock which can display multiple international clocks and timers. Chronos Clock provides a floating desktop clock, which has the ability to display multiple clocks showing the date and time in different time zones and in a variety of styles and formats. Chronos Clock is simple to install and easy to use. If you need to know the time in other countries you can quickly set up a clock showing the current time, and Chronos Clock also calculates the correct variations for Daylight and Standard time. 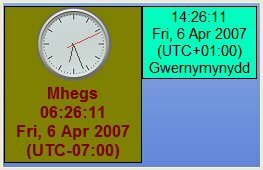 Multiple clocks showing the date and time in different time zones and in a variety of customizable styles and formats on a floating desktop bar. A powerful alarm system which displays popup messages, plays Wave, Midi sound files or audio CD's, Spoken alerts using the Speech System or Microsoft Agent, starts up other programs, shuts down your PC. Clock bar auto hide feature, letting Chronos fade away when not needed. Internet time synchronization with NTP/SNTP servers to ensure your PC’s clock is fully up-to-date. Time announcements and alarm alerts given by the SAPI speech system. Use of the Microsoft Agent to optionally speak the time and announce alarms. Popup calendar with daily diary notes and reminders. Quick reminder system for rapid alarm setup. Chronos Clock is a floating desktop clock which can display multiple international clocks and timers. And it is simple to install and easy to use. SonicFolder - a very easy-to-use add-on to the Windows Explorer which can help you open favorite folders quickly in Windows Explorer, Open/Save File Dialog or on the Desktop, etc. Life Tools - Organize Files Folders Websites using Life Tools Custom Menu application. One click systray icon access to your customized menu. The best file organizing widget to eliminate excess icons in your systray. AppendToFiles - Append data to the start or end of file names, folder names or file contents; Delete lines of text from inside files; Remove characters from folder names or from file names; filter files by date, size and pattern mask. FoldMonkey - Monitor folder for new or incoming files; Rename file; Create directories based on file names and extensions, creation, last accessed and modified dates; Create folder or Move files to a new directory. MaxMonkey - Help you maximize, minimize, close or restore multiple windows; detect applications that are hidden and still running but no longer in use; view hidden or stealth programs or viruses. RenameFromList - Help you rename multiple files or create multiple folders; change extensions; filter files by size, date and pattern and sort by name, date or size. All In One Computer Tools - Help you to remove sensitive data from your drive, encrypt files with TwoFish, protects your privacy by cleaning "Tracks", recover Web Password, automatically Shutdown, Reboot,or Log off the computer and so on.